LEN - www.lankaenews.com | Sirisena wallows in den of crooks – fears to entrust law and order to Field Marshal ! P.M. has to undertake that responsibility too! 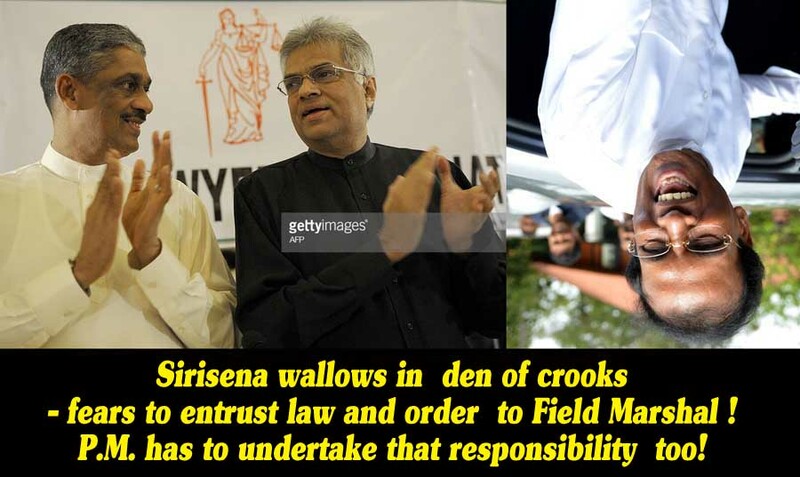 Sirisena wallows in den of crooks – fears to entrust law and order to Field Marshal ! P.M. has to undertake that responsibility too! (Lanka-e-News - 25.Feb.2018, 1.45PM) Though the entire country is demanding that the law and order ministry be entrusted to Field Marshal Sarath Fonseka , and even the prime minister had suggested that , yet because president Sirisena who is now desperately begging and cringing with a 4 % had decided against that most welcome move . By this it has been proved , although the president is making loud announcements and pronouncements that he would even go to hell ( himself an infernal being from hell) to trap the crooks , it is a well and widely known fact he is having underhand deals with the very crooks and the corrupt whilst protecting them. Consequently , the law and order ministry had been accepted by the P.M. at today’s cabinet reshuffle. Sagala Ratnayake who was the former minister in charge of law and order had been entrusted with the ministry of youth affairs which was under the P.M. He was sworn in today. It is crystal clear , the notorious Sirisena now best noted for his venal proclivities and clandestine traitorous activities , feared to hand over the law and order ministry to the Field Marshal who won a 30 years old war against a most dangerous terrorist outfit , not only because the Field Marshal would effectively and efficiently round up all the crooks, corrupt and cronies of the Rajapakse clan who are bosom pals of the president , but also because the family of the president has made monumental robbery and corruption their own favorite occupation too with president’s patronage. This additional burden entrusted to the P.M. while he is already shouldering most onerous responsibilities is certainly going to drive him into a thicket of immense difficulties. We shall publish a separate report in connection with the other details of today ‘s cabinet reshuffle.